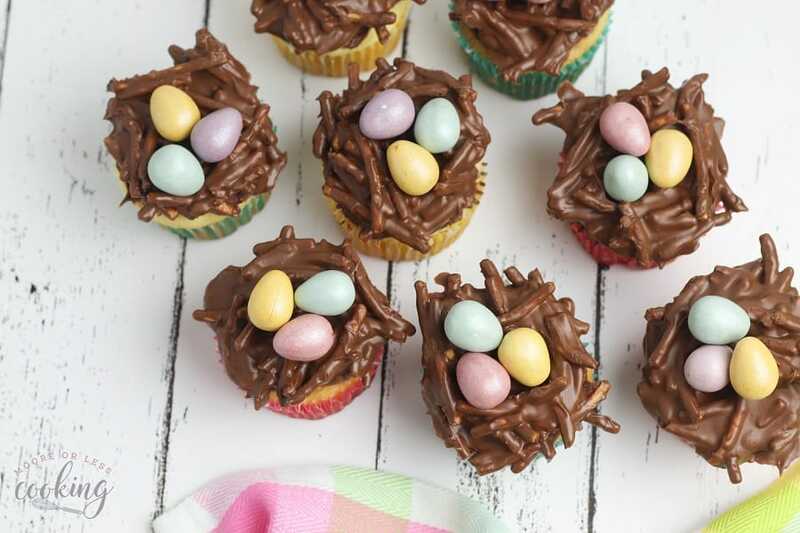 Making creative cupcakes is a fun way to celebrate a holiday, and that makes these adorable nest cupcakes the perfect way to welcome Spring. 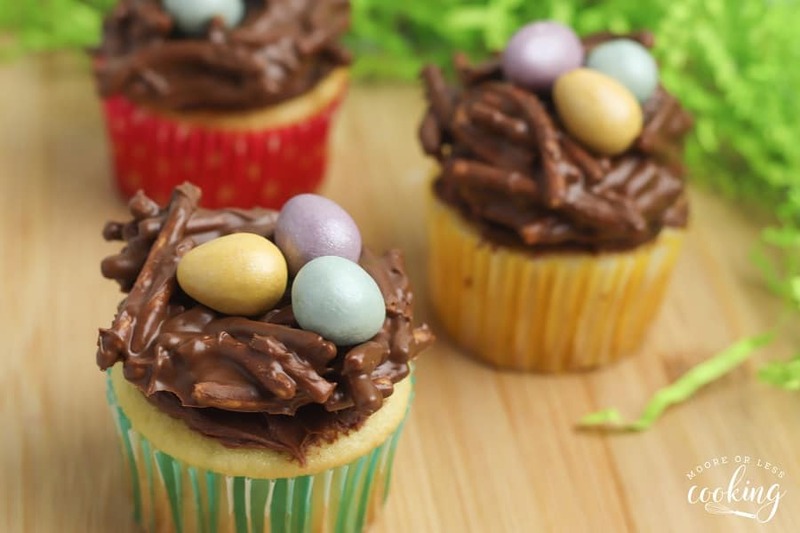 Whether you use them at your Easter celebration or make them for a fun Spring party, your guests will love eating these decorative cupcakes. In addition to getting a delicious cupcake, they’ll also get a salty-sweet cookie and some yummy chocolate Easter eggs, too! 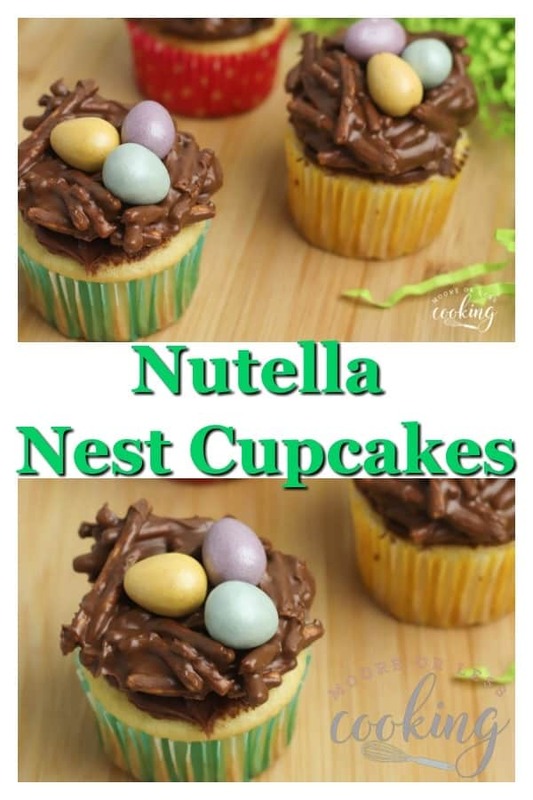 These cute Nutella nest cupcakes are made using a boxed cake mix and premade frosting, so this tutorial will focus on creating the adorable nest on top. 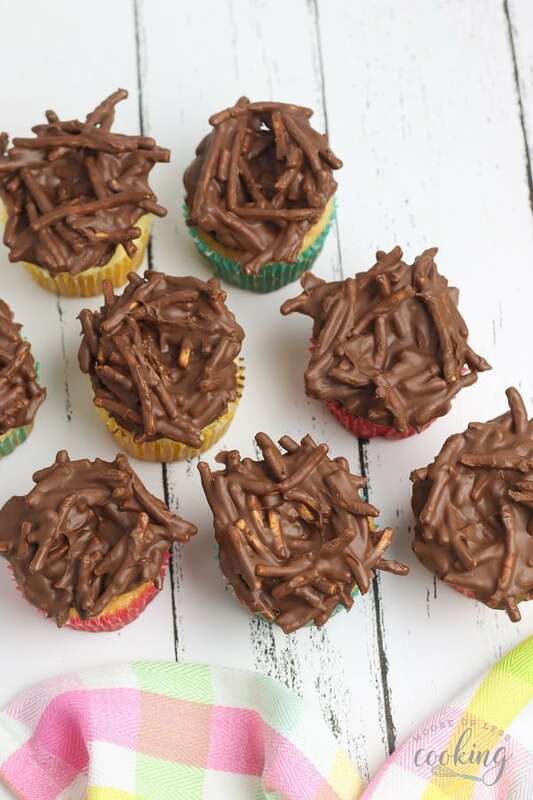 While I made my job a little simpler with this recipe and used premade options, you can use your favorite cupcake and icing recipe when you make your own nest cupcakes. 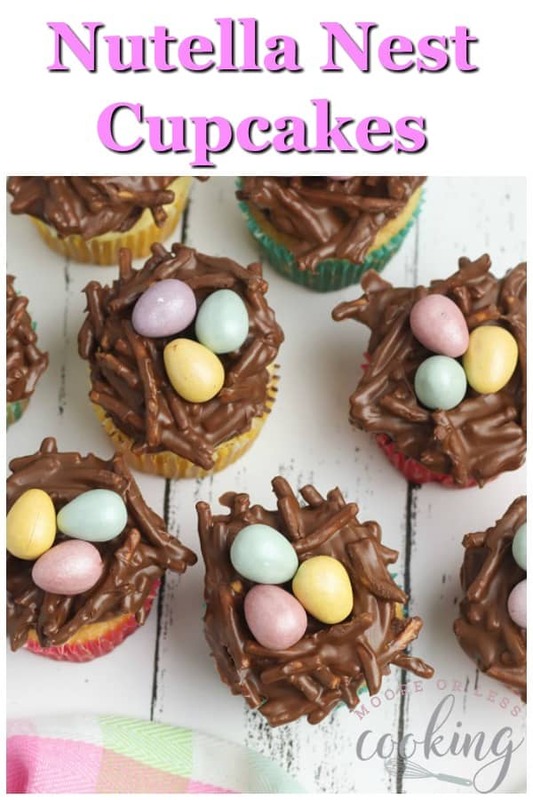 Whether you make vanilla or chocolate cupcakes is up to you, but I would suggest using chocolate frosting to complement the chocolate nest cookies on top. 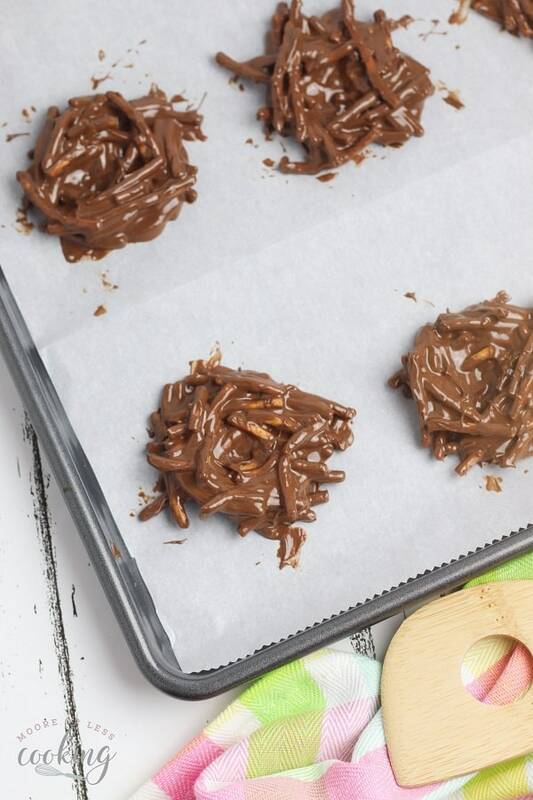 The nest cookies are a unique take on the classic no-bake haystack cookies, which are traditionally make with a peanut butter coating. To transform the haystacks into nests, you’ll replace the peanut butter with Nutella and create a nest shape as you form the cookie. 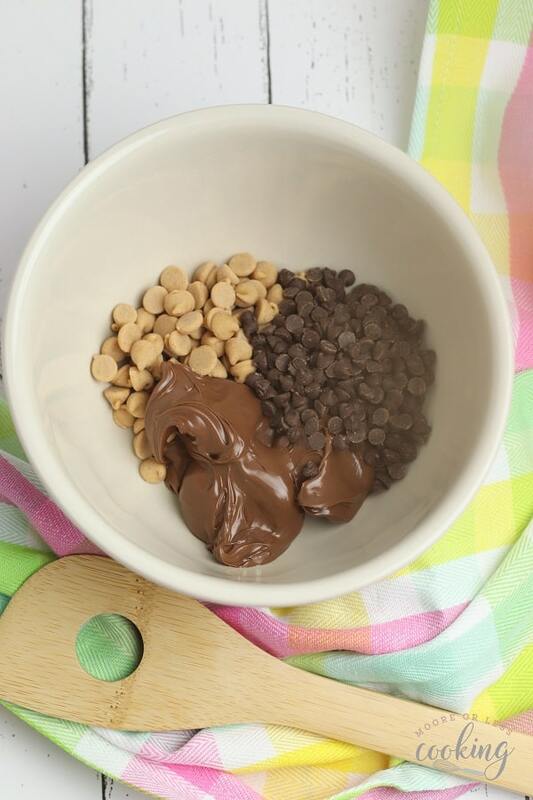 Start preparing your nest cupcake toppers by placing the Nutella, peanut butter chips, and chocolate chips in a microwave-safe bowl. Heat the mixture on high for 30 seconds, then remove it and stir. 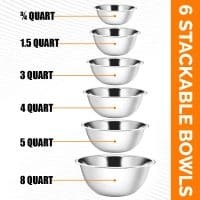 If the chips haven’t melted completely, place the bowl back in the microwave for another 30 seconds. When everything is completely melted, add the chow mein noodles to the mixture. 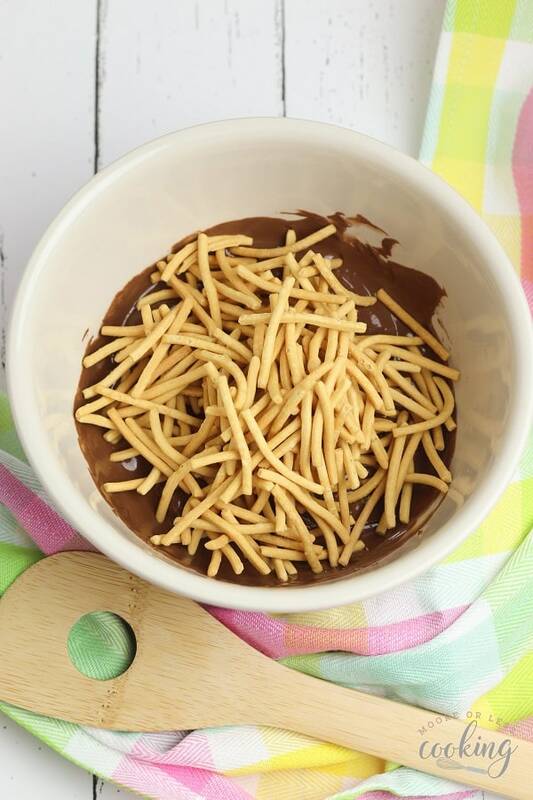 Stir slowly to make sure each of the chow mein noodles are fully coated with chocolate. As you stir, attempt to break apart the chow mien noodles into smaller pieces with your spoon. This will make forming the nests a little bit easier. 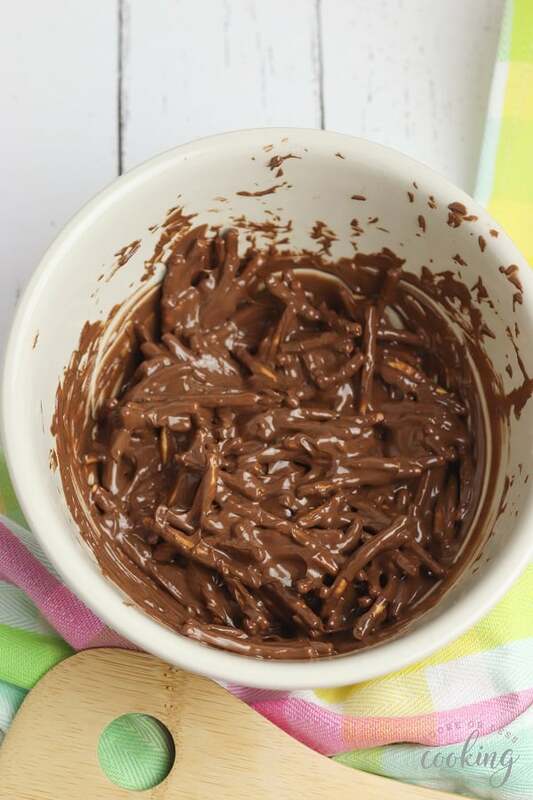 After the noodles are fully coated, use a tablespoon to school out chocolate noodle mixture. As you scoop, place your noodle nests on a piece of wax or parchment paper. 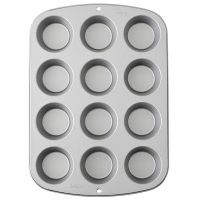 If your kitchen is warm from baking the cupcakes, it’s a good idea to place your parchment paper on a baking sheet. 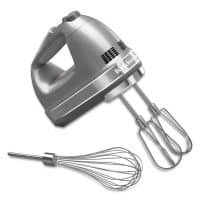 This will make it easier to transfer your no-bake cookies to the fridge to chill when you’re finished making your nests. To form a nest with the chow mien noodle mixture, use your fingers to shape the noodles into a circle. Then, press your thumb into the center of the circle to form an indention. That’s where your chocolate eggs will rest. 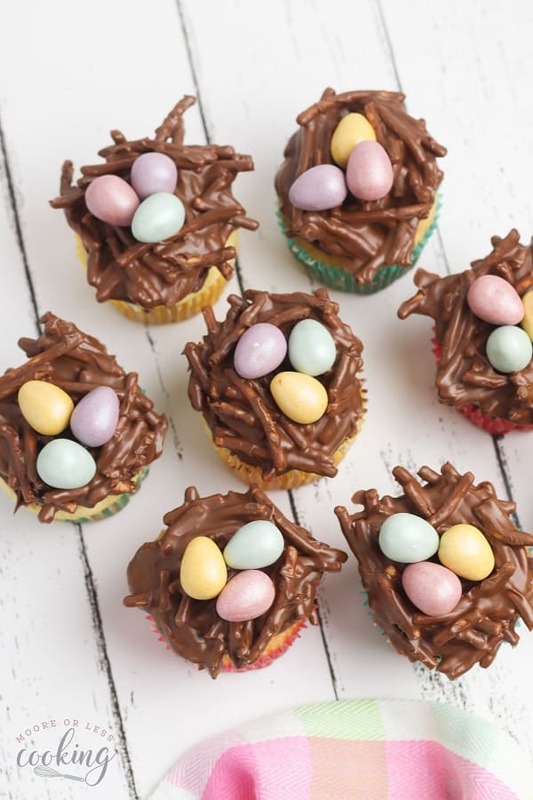 When you’re satisfied with your nests, allow the chocolate noodle bundles to rest until the chocolate sets. To speed up the cooling process, place the nests in the refrigerator until the chocolate has hardened. 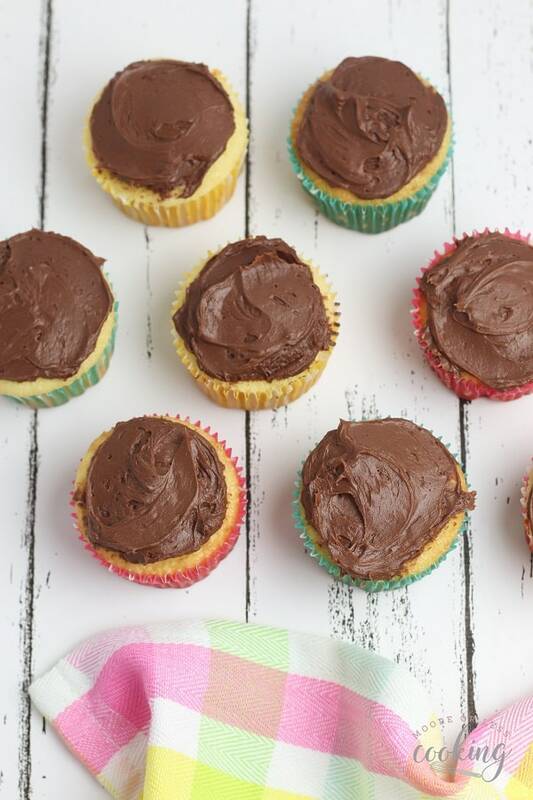 To prepare your cupcakes for the nest toppers, spread a thin layer of chocolate frosting on top of each cupcake. This layer of icing will help the nests stick to the tops of each cupcake. After the nests are set, place one nest on top of each cupcake. 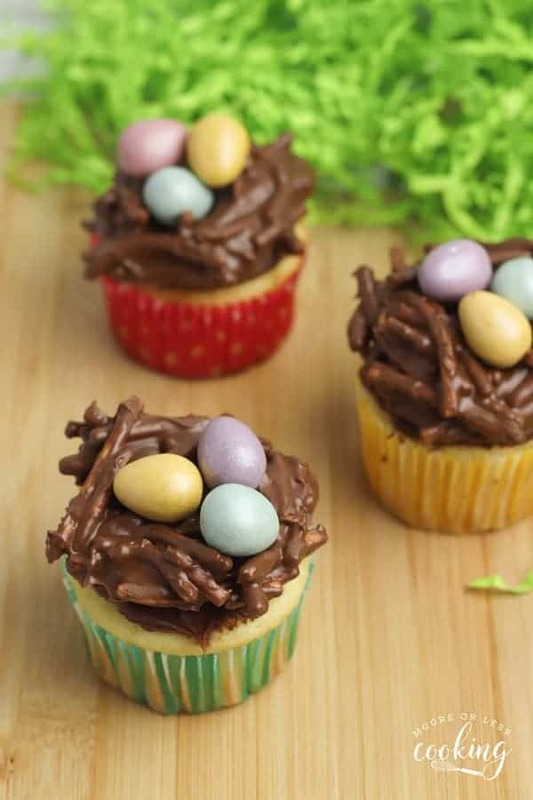 Then, finish decorating by adding three candy-coated chocolate Easter eggs inside each nest. 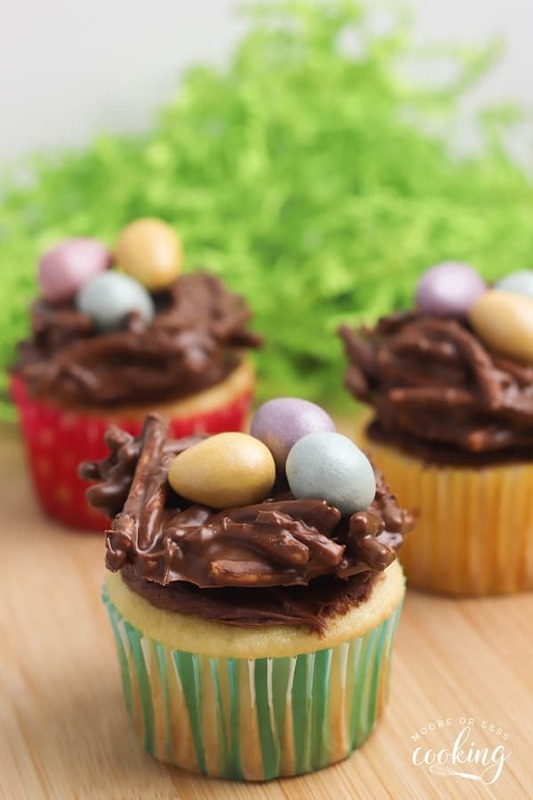 Bunny Ear Cupcakes are a simple recipe. Learn how to make them with this step-by-step tutorial! 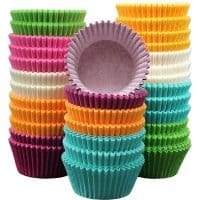 These adorable cupcakes are perfect for Easter, kid’s birthday parties, baby showers, spring parties and much more! Nettie is a wife and mother who is passionate about cooking and baking… especially when easy meals are involved! With 5 children, Nettie insists that all meals, snacks, and desserts come together quickly! Connect with Moore or Less Cooking! Be sure to follow me on  Instagram and tag  #mooreorlesscooking so I can see all the wonderful recipes that YOU make from this site! I also created a fun new Facebook group, and I would love for you to join us. It’s a group where you can share your favorite recipes, ask questions, share photos, and see what’s new with Moore or Less Cooking. I hope that you will join us there. If you would like to check it out, you can request to join  HERE. 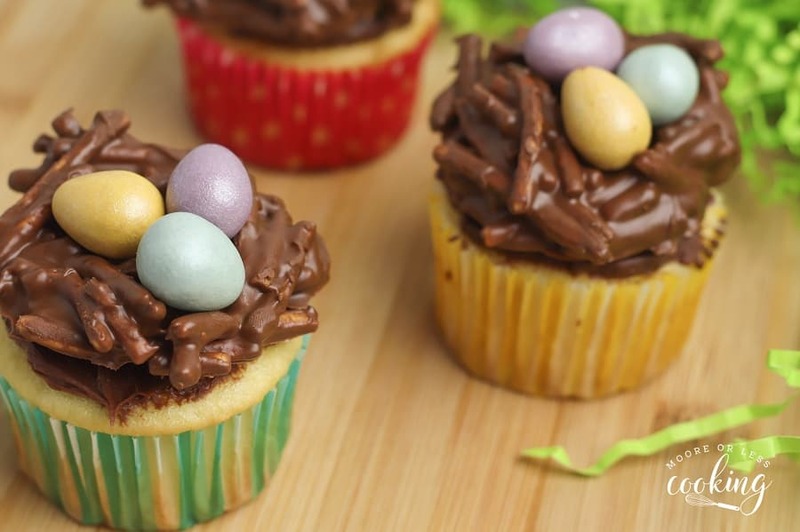 A sweet treat for your Easter dessert table! Pour the chow mein noodles into the hazelnut spread mixture and stir to combine. Press the spoon into the mixture to break apart the noodles as you stir. Add three chocolate eggs to the center of each nest.